Unlike clay domes that are more likely to crack and release clay dust. This dome is built from a double walled stainless steel that is insulated with thick refractory blanket. High Grade 304 Stainless Steel construction oven and cart. Stainless Steel Chimney with damper. The ilFornino® Grande G-Series flooring is made from 2” thick refractory pizza stone, same flooring used in commercial ovens. ilFornino® Grande G-Series comes with a Stainless Steel 304 Cart and Hardware. It has casters for easy maneuverability. The oven stands at 48”, the ideal height without bending your back. Heats up in as little as 35 minutes and retains the temperature for an extended time. This makes it economical using less wood to burn. On average you can cook a pizza in less than 2 minutes. ilFornino® G-Series Wood Fired Pizza Oven Series is proudly assembled from local materials in Valley Cottage, New York. It includes a Professional Pizza Peel, a Professional Brush/Scraper, and a Manual. Oven outside dimensions: 41.5" L x 45” W x 20" (to the highest point on the dome). Height of chimney stack is 28.5" H x 6" in Diameter. Door Opening dimensions: 35.5” W x 10.5” H.
Height assembled from floor to top of chimney: 93"
1 Cart with casters (Cart assembly required). This is a heavy duty 304 stainless steel oven built for commercial use such as restaurants, trailers, parties, etc...Unlike clay domes that are more likely to crack and release clay dust. This dome is built from a double walled stainless steel that is insulated with thick refractory blanket. The ilFornino® Grande G-Series flooring is made from 2” thick refractory pizza stone, same flooring used in commercial ovens. ilFornino® Grande G-Series comes with a Stainless Steel 304 Cart and Hardware. It has casters for easy maneuverability. The oven stands at 48”, the ideal height without bending your back. Heats up in as little as 35 minutes and retains the temperature for an extended time due to the amount of insulation. This makes it economical using less wood to burn. On average you can cook a pizza in less than 2 minutes. ilFornino® G-Series is proudly assembled from local materials in Valley Cottage, New York. It includes a Professional Pizza Peel and Professional Brush/Scraper. Convection (circulated heat); Radiant (from the hot flames and heated dome); Conduction (by the food sitting on the hot hearth). ilFornino comes with a built in thermometer. ilFornino Grande Series is a new design for commercial use. Anything you can cook in your indoor oven can be prepared to its succulent perfection in your wood fired oven, all year long. Use it to Bake, Roast, Grill ..... or simply enjoy the fire! 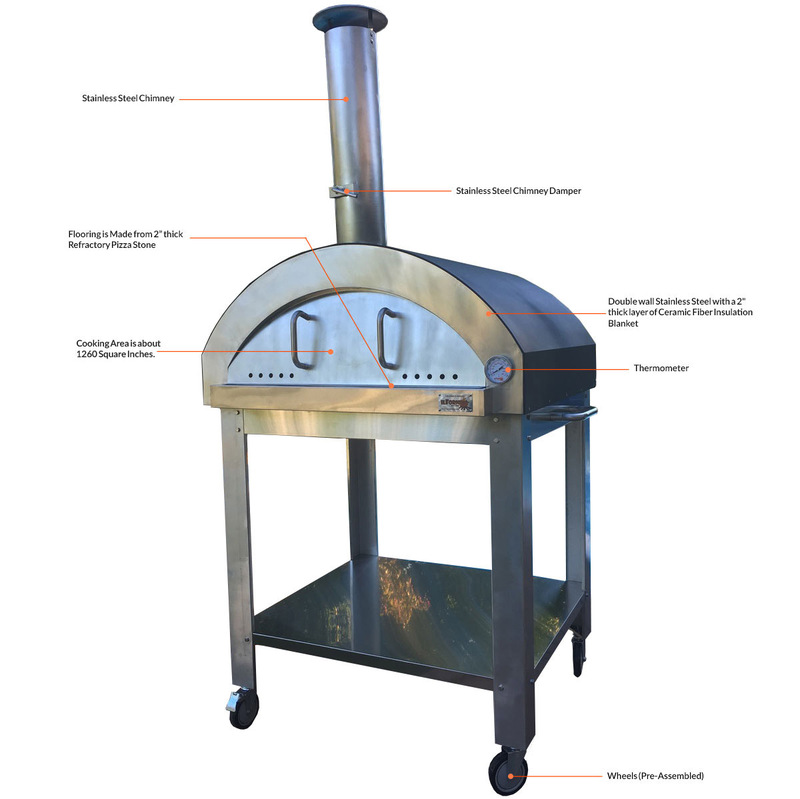 This Wood Fired Pizza Oven ships via freight carriers only and can be delivered to residential areas as well as commercial addresses. Remove the cart and place the Pizza Oven on your BBQ Island if desired. Cart assembly required. I cooked my first pizza in it last night and the result was much better than I expected. Very excited to cook more pizzas. i just baked my pizza in 2 minutes. I'm happy to buy this superb oven for my backyard. I ordered Grande G-Series Wood Fired Pizza Oven on black Friday sale. I got $200 off on the accessories. I'm so happy to buy it. All the accessories are used while baking pizzas. This oven is really a gem. Ilfornino Grande Pizza Oven is one of the best ovens because of its circulated heat and conduction. It can also be changed to bbq. I'm personally in love with this oven. We made 24 pizzas for my birthday party. All pizzas are perfect and delicious. Thank You for a great product.